Sherman Contemporary Art Foundation (SCAF) – established in 2008 under the Artistic Directorship of Dr Gene Sherman AM – is a philanthropic enterprise dedicated to providing an innovative forum for contemporary art and presenting work by internationally renowned visual practitioners primarily from Australia, the Asia-Pacific region and the Middle East. The Foundation was built on Sherman Galleries’ 21 years of commercial exhibitions and artist representation (1986–2007), a glimpse of which is provided in Twenty: Sherman Galleries (1986–2006). an artist in residency contemporary cottage. The multipurpose site and the Foundation’s constantly recalibrated cutting-edge technology enable the presentation of film and video to museum standards, immersive installations, architectural interventions and site-specific sculptures. Since 2008, SCAF has developed over 35 projects, produced 37 publications and staged over 400 talks, forums, workshops and functions. Among the many artists who have created site-specific projects for SCAF are Ai Weiwei (China), Janet Laurence (Australia), Dinh Q. Lê (Vietnam), Kazuyo Sejima + Ryue Nishizawa /SANAA (Japan), Tokujin Yoshioka (Japan) and Brook Andrew (Australia). Others, including Yang Fudong (China), Fiona Tan (Indonesia/The Netherlands) and Jitish Kallat (India), have presented existing work in accordance with SCAF’s mandate and site. M+, West Kowloon District Authority, Hong Kong. Concurrent or travelling exhibitions, co-publications, discrete projects and off-site events feature – and are constantly in planning. Entry to all SCAF projects is free, as is participation in all public programmes (SCAF occasionally charges for materials relating to workshops). SCAF is recognised as a pioneer in the Australian cultural landscape. As a privately funded, public exhibition space with a focus on the axis of the Asia-Pacific region and the Middle East, SCAF is staffed by highly qualified art professionals and directed by an academically trained proprietor with almost three decades of gallery management experience, outreach into the business, political and film worlds as well as engagement with the broader community. The Foundation’s longstanding singular geographic focus and rigorous standards distinguish it from other similarly conceived institutions. Dr Gene Sherman AM is a leading Australian cultural figure and philanthropist. She is Founder, Executive and Artistic Director of the Sherman Centre for Culture and Ideas (SCCI), established in 2017 as a cultural-exchange platform focusing on contemporary fashion and architecture. For 21 years (1986–2007) Dr Sherman was Director and Proprietor of Sherman Galleries, a commercial gallery with a focus on artists from Australia, the Asia Pacific and the Middle East. From 2008- 2017, Dr Sherman was Chair and Executive Director of the Sherman Contemporary Art Foundation, presenting 37 projects by significant visual practitioners across art, architecture, fashion, film and design from the Asia Pacific, Australia and the Middle East. She is Adjunct Professor, UNSW Art & Design, a Member of the Tate Asia-Pacific Acquisitions Committee (since 2009) and currently co-Chair (since 2015), a Member of the Tate International Council (since 2017), and a Board Member of The Australian Institute of Art History (since 2009). Dr Sherman regularly lectures on Australian and Asian contemporary art, Australian and Asian private foundations, gallery management, the art of collecting, and architecture and fashion. She was made a Member of the Order of Australia in 2010 in recognition of her cultural philanthropy and support of emerging and established artists. The French Government has honoured Dr Sherman with two prestigious awards in its Legion of Honour awards system: the Officier de l’Ordre des Arts et des Lettres (2016), and the Chevalier de l’Ordre des Arts et des Lettres (2003). Born and raised in South Africa, in 1976 Dr Sherman moved to Australia with her husband, Brian Sherman (co-founder of pioneering fund management group, EquitiLink). She taught at the University of Sydney from 1976 – 1980 and awarded her doctorate in early 20th century French literature from the University of Sydney in 1981. She later became Head of Languages at Ascham School (1981 – 1986). After 17 years teaching and researching at both secondary and tertiary levels, Dr Sherman founded Sherman Galleries, a two-site commercial art gallery based in Sydney and focusing on contemporary artists from Australia, the Asia-Pacific and the Middle East, including Gordon Bennett, Shane Cotton, Shaun Gladwell, Guan Wei, Janet Laurence, Akio Makigawa, Mike Parr, Imants Tillers and Hossein Valamanesh. From 1989, Dr Sherman worked extensively with now celebrated artists from Asia, including Ah Xian, Cai Guo-Qiang, Shen Shaomin, Wenda Gu and Xu Bing. Frequently producing up to 16 exhibitions each year, plus Australian and international touring shows, Sherman Galleries arguably became one of Australia’s leading private commercial art institutions and one of few private galleries operating at top-tier level in the Asia Pacific region. 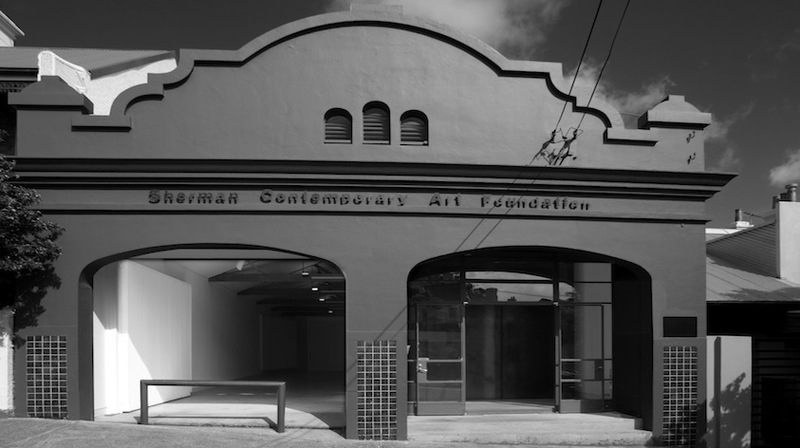 After 21 years (1986–2007), Dr Sherman closed Sherman Galleries and created the Sherman Contemporary Art Foundation (SCAF), a philanthropic enterprise dedicated to commissioning and presenting work by internationally renowned visual practitioners from the Asia Pacific, Australia and the Middle East. Over the decade of its operation (2008-2017), SCAF developed 37 projects, produced some 40 publications and staged over 400 talks, forums and workshops. Among the many creative practitioners who created site-specific projects for SCAF are Ai Weiwei (China), Brook Andrew (Australia), Alfredo and Isabel Aquilizan (Philippines), Jitish Kallat (India), Jompet Kuswidananto (Indonesia), Dinh Q. Lê (Vietnam), Sopheap Pich (Cambodia), Kazuyo Sejima + Ryue Nishizawa /SANAA (Japan), and Tokujin Yoshioka (Japan). In 2017, Dr Sherman presented SCAF’s final suite of exhibitions: The inventive work of Shigeru Ban, a two-site exhibition of the work of the eponymous Pritzker prize-winning Japanese architect; and two major exhibitions in Israel of leading Australian artists – Shaun Gladwell’s 1000 Horses (Tel Aviv Museum of Art) and the group show Tracks and Traces (Negev Museum of Art, Be’er Sheva), featuring Vernon Ah Kee, Brook Andrew, a newly-commissioned work by Shaun Gladwell, Rosemary Laing, Danie Mellor, Shirley Purdie, Scottish-born Joan Ross, Japanese-born Hiromi Tango and Christian Thompson. Established in 2018, Dr Sherman’s newest venture, the Sherman Centre for Culture and Ideas (SCCI), aims to forge a new path that elevates fashion and architecture to a more prominent place alongside other mediums of cultural expression, by providing a vibrant platform for the exchange of challenging ideas within the broader framework of culture. SCCI will feature two concentrated programmes each year, over the five-year period 2018-2022: SCCI Fashion Hub, in April/May, and SCCI Architecture Hub, in September/October. Partnerships have been developed with major Australian and international cultural entities including Google Arts and Culture, Sydney’s Museum of Applied Arts and Sciences (MAAS), the Australian Film, Television and Radio School (AFTRS), the University of Technology, Sydney (UTS) and the Barangaroo Delivery Authority (BDA). Dr Sherman is married, with two children and six grandchildren. She lives in Sydney, Australia. Dr Sherman’s former appointments include: inaugural Patron of the Centre for Fashion at the Museum of Applied Arts and Sciences, Sydney (2015 – 2018); Trustee, Museum of Applied Arts and Sciences (1995 – 2001); Board Member, Bundanon Trust (1995 – 2002); Deputy Chair, Power Institute Council at the University of Sydney (1996 – 2006); Art + Australia Editorial Advisory Board (2003 – 2015); Member, National Portrait Gallery Advisory Board, Canberra (2009 – 2011) and Deputy Chair, National Portrait Gallery Board of Trustees, Canberra (2011 – 2015); Member, Commissioner’s Council, Australian Pavilion at the Venice Biennale (2007 – 2009); Board Member, National Gallery of Australia Foundation, Canberra (2000 – 2009); Chair, Voiceless Council (2009 – 2015); Board Member, Australia Israel Cultural Exchange (AICE) (2005 – 2010); Patron, NSW Friends of Bezalel Academy of Arts & Design, Jerusalem (2005 – 2010); Member, International Council of the Asia Society, New York (2001 – 2003); Member, Advisory Board of the Asia Society, Australasia Centre (2002 – 2003); Member, Cultural Advisory Committee to the City of Sydney (1997 – 1999); Board Member, Australian Centre for Photography (1994 – 1997); Board Member, Visual Arts Export Group (1996); Board Member, Alliance Française de Sydney (1991-1994). Dr Sherman’s awards include an Honorary Doctorate of Design from the University of Technology, Sydney (2017); the B’nai B’rith award (2014); Member of the Order of Australia (2010), the Officier de l’Ordre des Arts et des Lettres (2016), and the Chevalier de l’Ordre des Arts et des Lettres (2003), both given by the French Government; and a Doctorate of Letters honoris causa from the University of Sydney (2008). She holds a PhD in French Literature from the University of Sydney (1981), a Master of Arts (Hons) and a Bachelor of Arts (French) (Hons) from the University of Witwatersrand, South Africa.